The Shiny Object Syndrome: the desire to have the latest martech with very little thought as to how it fits into our customer-first strategy. The Never-Ending Story: where a four-week “phase 1” grows to a four-month “phase 1” with no end in sight because we lose sight of the customer in trying to figure out how to make it all work for us. (Martech) Finger-Pointing: even with the best plans, things don’t always go quite as expected and instead of trying to understand what failed and why, we finger-point. And in some cases, we just buy different martech (see the first point). Scott Brinker’s Martech 5000 announcement made it clear that the marketing technology landscape has grown yet again in 2017, by about 40%, to a total of 5,381 solutions. Arguably, this evolution of martech has been driven by the very customer that is often pushed aside in an organization’s reactive strategy to the market. states that this infographic illustrates how every new technology to engage with prospects and customers spawns at least 100 related platforms. With the increase in marketing technology itself, comes an increase in vendors positioning their solutions for marketers to buy. There are suites, best-of-breeds, suites and best-of-breed hybrid models, all feeding the confusion. Let’s shift the lens and think about how marketers and marketing technology vendors can work together in a way that benefits them both. Marilyn Cox – VP of Marketing and CRM at The Second City – shared that when thinking about best-of-breed it’s important to remember that the application of the technology is just as (if not more) important than the technology itself. 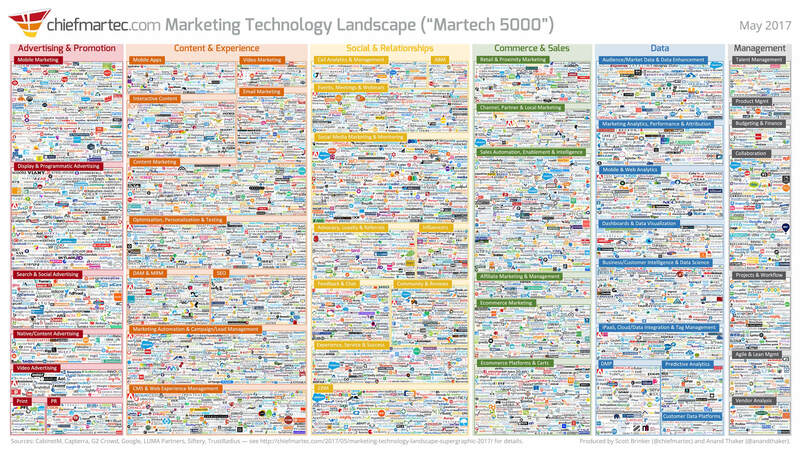 Marketing technology landscape? Check. Marketing technology vendors? Check. Next up – marketing technology customers (for those that have made it this far, this is us, the marketers). Gone are the days of marketing handing a lead to sales. Marketers are now aligned with the customer across the full experience, involved every step of the way. Account-Based, content, influencer, advocate, personalized, omnichannel marketing – the list goes on. The reality is what’s cutting-edge today will be standard operating procedure tomorrow – just like there is no crying in baseball, there is no standing still in B2B marketing. This truth is a major confusion-feeder – both within marketing, and between marketing and other teams such as sales and customer support. Modern Marketer Paul Stevenson, Head of Business Marketing Operations at O2 UK , is well aware of this reality – he was recently recognized as a “Modern Marketer of the Year” finalist at Oracle Marketing Cloud’s Modern Marketing Experience. The confusion is real, folks, but so are the industry-recognized Modern Marketers that are facing it head-on and winning with measurable results, directly impacting business outcomes. You can see this first-hand in the Markie Award finalist nominations of both The Second City and O2 – winning with customer-first strategies, leveraging martech to support the experiences in a measurable way. With my first question, “which came first, the customer or the martech?” answered, my second question is this, “what can you do right now to deliver the experience your customers are demanding?” Hint, it requires peak performance. We can help – contact us to learn more.